The Condon United Church of Christ will focus prayer on the needs of children in our community and world for five weeks as part of the Light a Candle for Children Prayer Vigil. The church will also be collecting items for twenty-five school kits for Church World Service, an ecumenical relief agency. Additionally, an educational workshop on raising moral children will be announced within a few weeks. 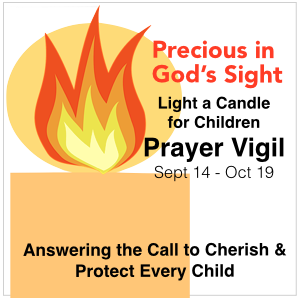 Believing that all children are, “Precious in God’s Sight,” the church invites the community to join in guided prayer. Free devotional books with daily scripture readings, reflections, and prayers are available at the church and other community locations. The daily meditations are also available by email at http://lightacandle.blogspot.com/, by Twitter at http://www.twitter.com/Pray4Children, and on Facebook at https://www.facebook.com/LightaCandleforChildren . Light a Candle for Children is an advocacy & prayer vigil project that invites congregations to join in Days of Prayer for Children. The vigil begins five weeks before the National Observance of Children’s Sabbath sponsored by the Children’s Defense Fund, Washington, DC. Thousands of congregations from Christian, Jewish, Muslim and other faith groups unite during Children’s Sabbath weekend to simultaneously witness for children through prayer, education, and worship. Light a Candle for Children, a project of the Family & Children’s Ministries Partnership of the United Church of Christ and the Christian Church (Disciples of Christ) is a part of this witness for children. Pastor Tim Graves of Condon is the editor and project coordinator for this national emphasis within the two cooperating denominations. Like the disaster relief kits the UCC made last year, the school kits for Church World Service are used by the ecumenical relief agency to respond quickly to disasters in the United States and around the world. According to CWS, “School Kits give children in impoverished schools, refugee camps, or other difficult settings some of the basic tools for learning.” Thirty-seven Christian denominations including the United Church of Christ are members of Church World Service. Visit http:///www.CondonUCC.org or http://www.Facebook.com/CondonUCC for more information. Call Rev. Tim Graves at 541-256-0565 or email CondonUCC@gmail.com if you have questions. Join us at Memorial Hall on Main Street before heading out for tricks and treats. 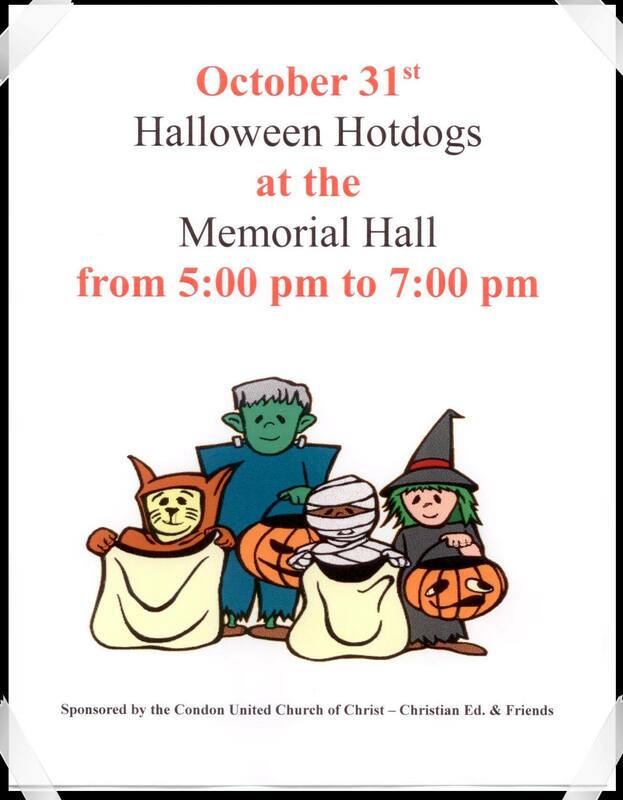 The Condon UCC Christian Education Committee will be serving hot dogs and more.